This photo of God’s Window in South Africa near Graskop and Hazy View (!) was shot too late in the morning so the scenery was hazy. So I tried “haze removal”. But the result is that the colors in the exported jpg are different from the colors in the darkroom view”. 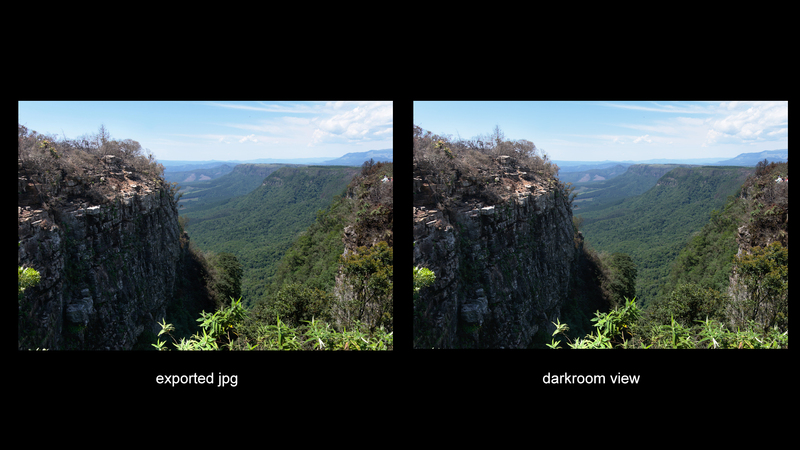 Below you will find screen shots of the exported image and the corresponding darkroom view. No haze removal. Exported image is ok.
Haze removal enabled. Strength = 1,0, distance = 0,25. Colors in exported image differ a lot from the darkroom view. The need for 1:1 warnings? 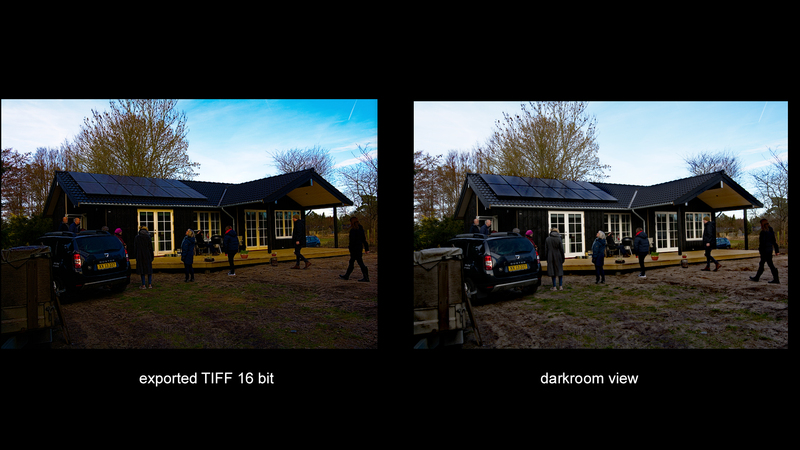 you should mention which darktable version you are running and maybe attach the XMP file. Did the xmp get uploaded? I will try once more. I’m running 2.6.0 and the only difference between the two images is the haze removal tool turned on/off with the settings mentioned in my first post. can you try if 2.6.2 maybe fixes your issue already? OK, I will try it and report back. I suppose I can get 2.6.2 by downloading the windows version from www.darktable.org/install? I installed 2.6.2. Opened the photo in darkroom using the same xmp and then exported the image to jpg. Are you sure this isn’t a color profile issue? What are your working, output, and softproof profiles set to? You may consider checking “Lighttable/Global options” first. You might have changed something there without noticing. Or, you can open and save another photo (with similar colors, with just a basic processing) to see whether it also shows the same abnormality. @obe : I see a difference on the pictures you posted. the exported one is more colorful. I’m not certain that it isn’t a color profile issue but I have never had any wish to change the color profile settings since everything was working fine (apparently) using all other tools. Color profiles are a hard subject to fully understand. After having experienced the problem and before posting I have studied the manual and looked through the settings without succes. Your file format setting is 8 bit jpeg with a low-ish quality (73). That may be too low to reproduce the colors you saw on darktable screen. As an example, my settings are Tiff, 16 bit. Just a thought. I have also tried it with JPG quality (100) and with Tiff (maybe this was 8 bit can’t remember) same result. I think that the differences are so big that there must be some other explanation. So you think it’s a bug? Here is another example. Almost no editing is taking place except for haze removal (just to demonstrate the effect) and output is 16-bit TIFF. I also upload the xmp. Please check your OpenCL settings (as per post above). If you have it On, turn it Off (and restart dt to be on the safe side), and make another test. Turning OpenCL off doesn’t make any difference. Look at the result using RT 5.5. for haze removal below. 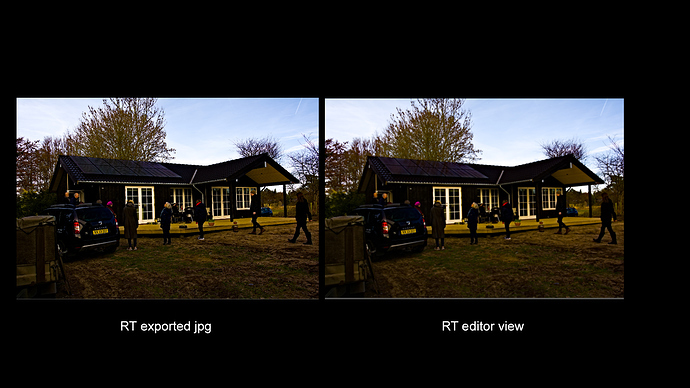 The RT editor view and the JPG are very much like the TIFF in the latest example. So it seems to me that the darkroom view could be wrong? Thank you for many responses and ideas, but no solutions or explanations have materialized. I have installed 2.6.2 from scratch on another windows pc running only default settings. Same problem. I will upload the photo and the xmp. I hope that some of you will test to see if the problem exists on other platforms and systems………? The haze removal is taking a lot of the colours out of gamut so I’d guess that’s at the root of the problem. Yes, I know and I have given it som thought. The blue sky is not out of gamut in the darkroom view and yet the color of the sky is changed a lot in the exported image?